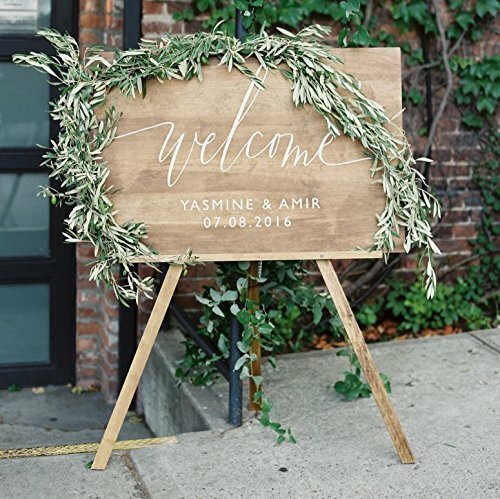 Wood Wedding Welcome Sign | Welcome Wedding Sign | Wooden Welcome Sign | Wedding Welcome Sign by Sweet Carolina Collective at HoldUp Art. Hurry! Limited time offer. Offer valid only while supplies last. DETAILS: This listing is for one wedding welcome sign. This sign is a beautiful decor piece for the entrance of your wedding ceremony or reception. DETAILS: This listing is for one wedding welcome sign. This sign is a beautiful decor piece for the entrance of your wedding ceremony or reception. Photo in listing is the 24"x36" option with the English Oak Stain. Your sign will ship out in approximately two business days after purchase. Each of our welcome signs is made with high quality stained birch and hand painted with white acrylics. INFO NEEDED AT CHECKOUT: Please provide your names and date in the notes at checkout, we can only go off what you provide:) We will make the sign exactly like the picture with all capital letters. SIGN SIZES: Size 1: 9x15 (stand not included) Size 2: 12x20 (stand not included) Size 3: 16x20 (made to sit on an easel or chair - not included) Size 4: 18x24 (made to sit on an easel or chair - not included) Size 5: 24x24 (made to sit on an easel or chair - not included) Size 6: 24x36 (made to sit on an easel or chair - not included) STAIN COLORS: -English Oak (pictured) -Weathered Gray -Dark Walnut SHIPPING: -Sign will ship in approximately 2 business days after purchase. If you have any questions about this product by Sweet Carolina Collective, contact us by completing and submitting the form below. If you are looking for a specif part number, please include it with your message.